Congratulations to winners of the Dutch Open, Brass Band Schoonhoven. The band impressed with the expertly performed 30 minute programme at the De Lawei Theatre in Drachten, under the direction of Ivan Meylemans. Dutch National champions De Waldsang were beaten into second place by the narrowest of margins with Brass Band Groningen coming in third. Brass Band Schoonhoven programme began with Lode Violet’s arrangement of ‘Sang Till Norden’, followed by superb Flugel soloist Denis Vork who won the soloist prize with ‘Zdes’ Khorosho’. 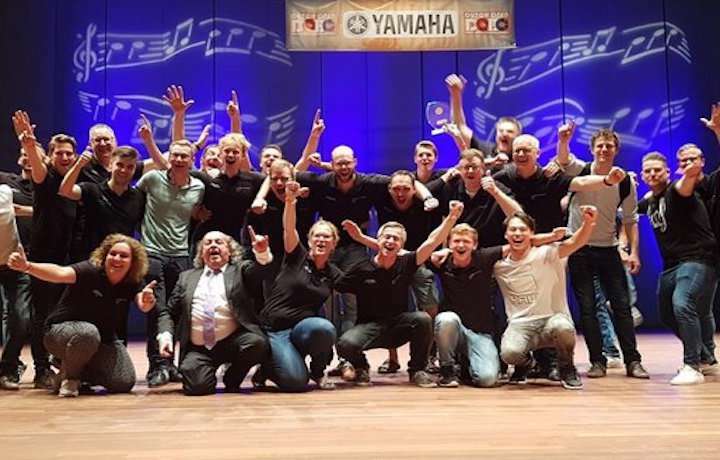 Schoonhoven closed their set with a scintillating performance of 'Perihelion- Closer to the Sun' with their victory earning them prize money of 500 Euro and the opportunity to perform in a Yamaha sponsored event later in the year. Adjudicators Jan Van der Roost and Danny Oosterman were clearly impressed commenting on the band’s "Great playing throughout the programme and a fantastic performance of Perihelion" as well as acknowledging a “great band and conductor." Congratulations also go to Second Division champions Brass Band Constantijn Huygens and their Musical Director, Richard Visser.